The class of 2020 continues to slide closer to the podium and with that means some new national names and others to pay close attention to as they continue to ascend up the ranks. One such talent is junior lead guard Caleb Love of Christian Brothers College in Missouri. A talented 6-3 170 plus pound guard, Love can do a little of everything on the hardwood. Equipped with athleticism and explosiveness the talented guard handles the ball well, he can attack off the bounce, he has the ability to score in transition, and he can rip the nets with a perimeter stroke that extends beyond the arc. A solid scoring talent at multiple levels, Love also has decent vision and he’s a menace on the defensive end of the court at times with his ability to play on and off the ball effectively. 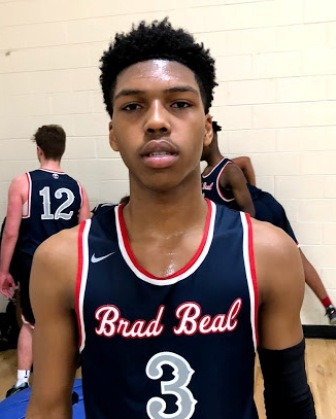 The talented 2020 standout started his ascent in the Generation Next Basketball Association middle school platform presented by NY2LA Sports and after hitting high school Love has continued to elevate with each passing year as he’s firmly established as one of the premiere guards in the class both regionally and nationally. Saint Louis, Indiana State, DePaul, Kansas State, Indiana, Missouri, Louisville, Illinois, Purdue, Iowa, Creighton, Florida, Texas A&M, Xavier, SIU-Edwardsville, Oklahoma State, Butler, Northwestern, Marquette, and Texas have offered to date. Primed for a big junior campaign expect to hear a lot about Love in the coming months as he’s continuing to elevate his status with each passing month. Love played with the Brad Beal Elite program during the grassroots travel season.